The Indigenous Comic Con welcomes back Jonathan Joss (Comanche/Apache) for his third year! 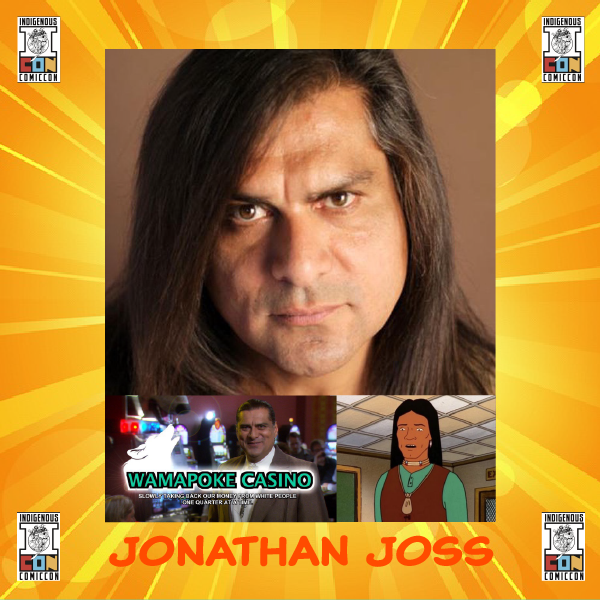 Known for his roles in the Magnificent Seven, Parks and Rec, and John Redcorn on King of the Hill, Mr. Joss is a multi-talented actor and producer who began his television career more than twenty years ago. A generous and dynamic guest, we are thrilled to have Mr. Joss back with us once again! You can meet and greet Mr. Joss at our opening night kick-off with purchase of any of our VIP Passes! Mr. Joss will be available for autographs and photos throughout the Comic Con. ICC18 Welcomes Back Meow Wolf!